Sony Tablet S features 9.4" display with TruBlack and the Sony Bravia technology having 1280x768pixel resolution and it is powered by 1GHz dual core NVIDIA Tegra 2 processor and runs on Android 3.1 Honeycomb with a possible 3.2 iceCream Sandwich OS update when on launch. The Sony S sports a 5MP rear camera and 3MP front facing camera. Other features of Tablet S includes DLNA capability, ability to run as an infrared remote. The Tablet S comes with Sony's Music, ebook and Video Unlimited service, which will let users download video and audio content seamlessly. Additionally, the Tablet S is PlayStation certified and will come packing with some games which can also be downloaded from a vast collection. 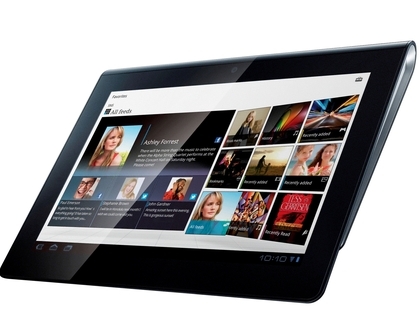 The Sony Tablet S will be available from September in US and UK for a price tag of $599 and £500 respectively. It will be available in India by year end. Tag:Sony S1, Sony Tablet S, Sony Tablet S features, Sony Tablet S specifications, Sony Tablet S review, Sony Tablet S details, Sony Tablet S availability, Sony Tablet S specs, Sony Tablet S images, Sony Tablet S pics, Sony Tablet S pictures, Sony Tablet S imgs, Tablets, Android 3.2 icecream Sandwich OS tablets.